If there’s one good thing to come out of the fall of the Last City at the start of “Destiny 2,” it’s that you get to hang out in the game’s new social area, an extremely peaceful farm. 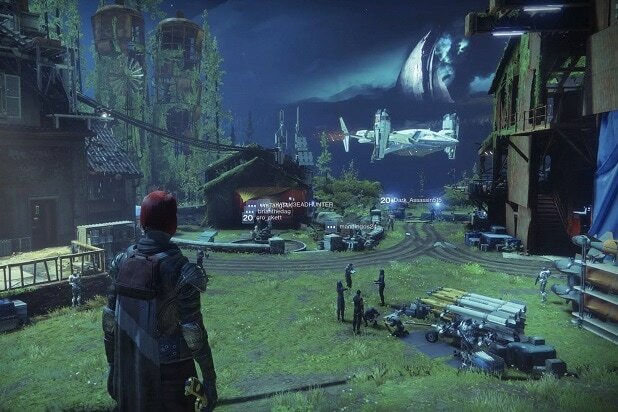 After everyone flees the City when it’s attacked by the evil Red Legion, you can no longer return to the Tower, the place where players congregate between missions in the original “Destiny.” The replacement is a small refugee camp built in an overgrown farm in Earth’s European Dead Zone. Also Read: 'Destiny 2': What Do the Ending and Post-Credits Scene Mean? The Farm is pretty different from the Tower aesthetically, but it’s functionally the same place that players hung out in during their previous stays in “Destiny.” You can visit shops and buy new gear, turn in missions for rewards, and meet up with new players. The farm has a couple of other interesting additions: There’s a soccer field at one end where you can play impromptu matches with other players; and since it’s a farm, it has chickens. But at the end of the “Destiny 2” story campaign, the Tower is rebuilt and you’re able to return there. All the important characters, like the Vanguard leaders and the major shops, are back at the Tower. And the farm’s spot on the map is replaced by the Tower as well, suggesting you can’t return. There’s good news, though — you can return to the Farm and hang out with chickens. There’s just not a lot to do there. Since the Tower is rebuilt and most of the important characters return to it, the farm is pretty empty. There’s only a Postmaster, so you can receive mail, the vaults where you can drop off and pick up your stored items, and a Cryptarch, who can decode engrams you find in the game to turn them into weapons and armor. The soccer field is still there and so are the chickens, but none of the other important people, like the Vanguard, Lord Shaxx, or the Gunsmith remain. Still, the Farm is a nice place to hang out between missions when you haven’t got much to do. There also are bits of story secreted around the place if you’re willing to search for items that your Ghost can scan, so it’s not a total waste of time to wander around in the little slice of rustic paradise. 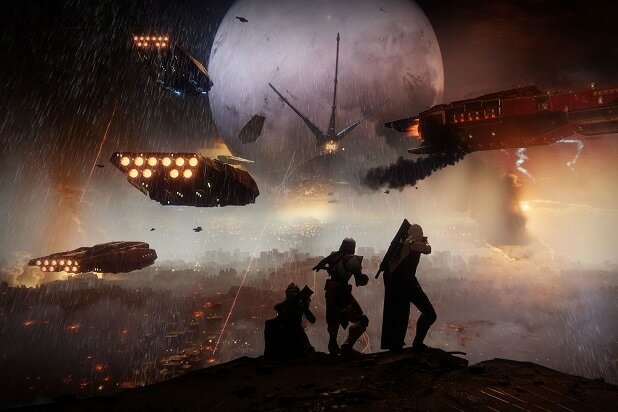 The arrival of "Destiny 2" brings a new chapter to the hugely popular video game and its extremely dense world of aliens, space travel and magic in the distant future. But if you missed "Destiny" or you just can't remember all the admittedly confusing stuff that happened in the first three years of the series, we've got a rundown that can help. Here's the entire "Destiny" story, through the main story missions of "Destiny 2." Warning: Spoilers! Not long into our future, humanity ventures to Mars, where they discover a huge robotic entity from beyond the solar system that they come to call the Traveler. With some kind of amazing magic powers, the Traveler makes it possible to terraform the entire solar system (though it only terraforms a couple planets). Technological advancements thanks to the Traveler usher in the Golden Age of humanity, which stretches on for hundreds of years. Then, some time hundreds of years before the game takes place, an unknown evil that chases the Traveler around the universe called the Darkness arrives at Earth. Nobody’s quite sure what happened, but the arrival of the Darkness created chaos and death. The Golden Age ends with a calamity known as the Collapse. Along with the Darkness, or as part of it, come a bunch of different alien species who invade the solar system. They are the Fallen, a group of technology-worshiping scavengers; the Hive, a crustacean-like race obsessed with death and magic; the Cabal, a militarized empire that subjugate or destroy whole planets; and the Vex, a time-traveling robotic collective that turns planets into giant machines. The Traveler manages to fight back the Darkness, but in so doing, goes dormant. Its last act is to create thousands of little floating artificial intelligences called Ghosts. The Ghosts then go out and reanimate dead bodies — weird, admittedly — with the near-magical power of the Traveler, called Light. Those reanimated folks are basically turned into immortal super heroes who will later come to be known as Guardians. The Guardians’ charge is to use their power to protect the rest of humanity from its alien enemies. In addition to humans, there are two other races in “Destiny” outside of the evil aliens. The Exos are sentient robots who were created from humans (think the Major from "Ghost in the Shell") that were created to fight wars during the Collapse but have become alive thanks to the Traveler, and the Awoken are a blue-skinned, humanoid alien race of unknown origin. In the years after the Collapse, some of the newly reanimated Guardians don’t do the good guy thing. Instead, they become warlords and try to subjugate the people still alive on Earth. In response, a group of heroic Guardians band together, becoming a group known as the Iron Lords. The seven Iron Lords push back the warlords and protect civilians, until eventually, the other good Guardians and remaining civilians raise a walled city beneath the Traveler. The Last City is the only real safe place left in the solar system, and the Guardians form a militia known as the Vanguard to protect it. Soon after the creation of the Last City, the Iron Lords encounter a Golden Age technology called SIVA. Known as a “techno-plague,” SIVA is a swarm of nanomachines, or microscopic robots that can affect matter at the molecular level. SIVA corrupts much of the area and life around Russia where it was housed and manufactured, and the Iron Lords come together to destroy the scourge. They attack the underground facility where SIVA is made, but are unable to defeat it. Instead, they sacrifice themselves to seal SIVA away. Only one Iron Lord who takes part in the mission, Lord Saladin, survives. Years later, the various disparate factions of the Fallen, known as Houses, band together to attack the City. Lord Saladin leads the defense of the City with the Vanguard at a location known as Twilight Gap. The huge battle sees the permanent deaths of many Guardians, but the Vanguards manage to fight off the Fallen and protect the City. Sometime after the creation of the Last City, the Vanguard martial an attempt to recapture the Moon, which was overtaken by the Hive after the Collapse. The attempt is an abysmal failure. The powerful Hive Prince Crota leads the Hive forces in defense, wielding a sword that absorbs the Light of Guardians and kills them permanently. After the failed attempt at retaking the Moon, the Vanguard declares the Moon off-limits to Guardians. Here's where “Destiny” starts -- with a Ghost finding the player’s character among the dead in what was formerly Russia. The area is enemy territory controlled by the Fallen, so the player has to fight their way out to find a ship and make it to the City, where they start their life as a Guardian. The player heads back to Russia in hopes of finding a drive for their ship that will let them travel between planets in the solar system. Along the way, they discover nests of the Hive on Earth, suggesting the beginnings of an invasion. You head to the Moon to gather more information and try to stop the Hive’s plans. While there, you’re contacted by a mysterious Exo Stranger (that’s, uh, her name), who asks you to come to Venus to deal with another threat, should you survive on the Moon. The player manages to fight disrupt the Hive’s rituals and invasion plans, if temporarily. Arriving on Venus, the player is introduced to the Vex. The scary robots are also creating some kind of plan to take over the solar system, and it’s even scarier than what the Hive is up to. It has something to do with a strange place called the Black Garden, possibly the extradimensional birthplace of the Vex. The player heads to a section of the Asteroid Belt known as the Reef, where the majority of the Awoken live, to ask for information. The Awoken inform the player that the only way to get to the Black Garden, which the Vex have managed to separate out of space and time, is with a piece of one of their robots, called a Gate Lord. The player heads to Mars, which is largely controlled by the Cabal, and battles through them to find and destroy the Gate Lord. Using a piece of it, the player opens a portal to the Black Garden, where the Vex have a chunk of the Darkness that they worship as a god. The player destroys this Black Heart, disrupting the Vex plans and returning Light to the Traveler, finally allowing it to begin healing. “The Dark Below” is the first of four expansions released for “Destiny.” After defeating the Vex and restarting the Vanguard’s ability to begin trying to retake the solar system, the player meets Eris Morn. She’s the only survivor of a team that went to the Moon to try to take down Crota, and was trapped in the Moon’s dark tunnels for years. After finally escaping, Eris convinces the player to head to the Moon and stop the Hive bringing about Crota’s return. The player manages to disrupt a ritual to revive Crota. In the expansion’s six-player Raid mission, players managed to summon and kill Crota once and for all. The second expansion for “Destiny,” “House of Wolves,” starts in the Reef with the Awoken. Mara Sov, the Awoken queen, previously had a Fallen house that served her: the Wolves, but they escaped. Their leader, Skolas, attempts to unite all the Fallen houses, something that hasn’t happened since the Battle of Twilight Gap. The Awoken ask the player for help, and together they manage to track down Skolas and recapture him. Expanding on the lore of the Hive, the third “Destiny” expansion, “The Taken King,” centers on Crota’s father, Oryx. One of the original Hive who’s worshipped as a god, Oryx arrives in the solar system in a huge ship called the Dreadnaught, which sports a massive superweapon. After wiping out the Awoken fleet, Oryx starts attacking everyone else in the solar system, using his power to corrupt, or “take” other creatures. The Cabal counterattack, crashing a ship into the Dreadnaught to get troops aboard and attempting to take the ship themselves. The player eventually manages to board the Dreadnaught as well and stops the Cabal’s plans to destroy it. After disrupting the superweapon so the Vanguard can attack the Dreadnaught, the player manages to defeat Oryx in his physical form. In the expansion’s Raid, “King’s Fall,” the Guardians venture to Oryx’s home, another dimension called the Ascendant Realm, to kill him for good. The last “Destiny” expansion delves into the history of the Iron Lords. On Earth, the Fallen House of Devils discovers the dormant SIVA vault and opens it, using the technology to turn themselves into powerful cyborgs. With the plague loose, parts of Russia are overrun and the SIVA begins to reshape it. Lord Saladin summons the player to investigate what’s happening. Eventually, the player manages to destroy the SIVA vault, halting the creation of any more of the technological virus. In the “Wrath of the Machine” Raid, players put an end to the SIVA crisis by taking out the Fallen leader who was behind it, a huge cyborg fallen called Aksis. The player barely escapes death and manages to sneak out of the City. While in the wilderness, the Guardian receives a vision apparently from the Traveler pushing them to find the Shard of the Traveler, a huge chunk of the robot that fell to Earth during the Collapse. Along the way, the player meets Hawthorne, a woman who lived outside the City and has been gathering and helping refugees ever since the attack. Following the vision, the player heads to the Shard, and is reinfused with the Traveler’s Light. That makes them the only immortal Guardian left (although, since there are thousands of players, everyone gets to be The Only Guardian Left). Hawthorne and the player get the refugee camp known as the Farm up and running and establishing a radio relay to help find more people in need. But when Hawthorne activates the relay, she and the player hear a transmission from Zavala, one of the leaders of the Vanguard, imploring all Guardians to meet on the Saturn moon of Titan to prepare to counterattack the Red Legion. Against Hawthorne’s wishes, the player heads to Titan to meet Zavala. Turns out, Ghaul’s villainous master plan is to force the Traveler to give him the power of the Light, which he’ll use to overthrow the Cabal empire and remake it in his image. He captures the ostensible leader of the City, the Speaker for the Traveler, and tortures him to get information about the Traveler. It turns out that Titan wasn’t such a good place to meet up, thanks to the Fallen and the Hive being there first. The player has to help the Vanguard get set up on a giant floating ocean platform, kind of like a huge oil rig. Turns out, Ghaul has a ship called the Almighty, which can destroy the sun. Zavala decides it needs to be blown up before the Vanguard can attempt to retake the City, since the Cabal Empire's war doctrine is to destroy the worlds they can't take over. He sends the player to find the other two Vanguard leaders, Cayde-6 and Ikora. Next, the player heads to Nessus, a minor planet that has re-entered the solar system. That’s where Cayde-6 was believed to have headed. The player finds the Vex there, as well as the Fallen, fighting over the rock. You manage to rescue Cayde from being in a loop between Vex teleporters. He explains he was trying to steal one of those teleporters planning to use it to get close to Ghaul and kill him. With your help, he now has the teleporter he needed, and leaves to meet up with Zavala. Ikora is on the Jupiter moon of Io, which is known among the Guardians as the last place touched by the Traveler. She’s gone to try to figure out who and what she is in the absence of the Light. The player manages to convince her to return to the Vanguard when she learns about the Almighty, but she also discovers you can't just blow up the ship — that’ll take the sun with it. With the player’s help, Ikora gathers information about how to disable with the ship instead. With the Vanguard reunited, the plan is to gather everyone together for an assault on the Last City. First, the player steals a Red Legion ship and takes it to the Almighty, executing the plan to disable it. With the weapon destroyed, the Vanguard launches its offensive on the Red Legion, with the player arriving mid-battle to help out. The Vanguard leaders manage to get in place with their teleporter, but are too hurt to take on Ghaul themselves. You wind up doing it instead. Ghaul has killed the Speaker and manages to use the ship to infuse himself with Light in the final battle, declaring that he is worthy of the Traveler’s gifts. He uses abilities that are pretty similar to some of the Guardians’ superpowers, but eventually, the player puts him down. Ghaul overdoes it with the Light infusion, becoming a huge, drippy font of power. But before he can wreak havoc on everyone who stands against him, the Traveler rebukes him, finally awakening and blasting Light back through the solar system. The Light eradicates Ghaul and gives the Guardians their gifts back, allowing them to push the Red Legion out of the City. In the post-credits scene at the end of “Destiny 2,” the Traveler’s released light covers all of Earth. It continues to flow outward, expanding through the solar system, and then through the Milky Way Galaxy and beyond, into the area between galaxies known as dark space. There, the wave of Light flows over a group of black, pyramid-like ships, which start to come alive as soon as they encounter it — suggesting some new enemy of the Traveler is on its way. Like “Destiny” before it, “Destiny 2” is sure to have more story content added to the game in the future. In fact, there’s already one addition in the pipe: the game’s first Raid, which launches on Sept. 13. Dubbed “Leviathan,” it could deal with some of the loose ends left over from the story, such as the Almighty or the remnants of the Red Legion. ‘Destiny 2': What Do the Ending and Post-Credits Scene Mean?